These sunburst earrings by Hattie Carnegie have emerald-glass baguettes emanating from a pavé center. The setting is rhodium-plated. These elegant 1950s ear clips coordinate beautifully with a brooch by the same maker in a similar design. Pieces like these never go out of style and always look gorgeous wherever they’re worn. I got to see these earrings sparkle on a model who walked the runway at Toronto Fashion Week 2019. Scroll down to see the coordinating brooch and a dress clip to wear with these lovely jewels. 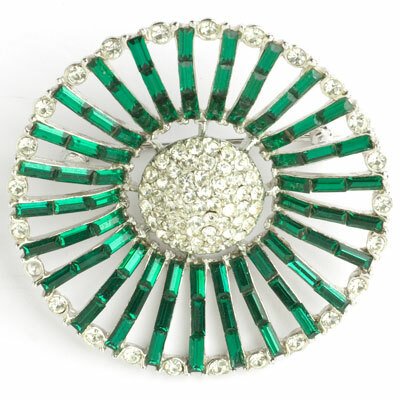 This 1950s sunburst brooch has rays of emerald-glass baguettes emanating from a pavé center and joined by an outer-circle of diamanté. The setting is rhodium-plated with a roll-over safety clasp. The design is classic, and the color combination is lush! In fact, Carnegie made a pair of ear clips with the same motif a few years later. Scroll down to see them.